In my two decades in the space industry, one thing I’ve learned is that “change is constant.” New competitors appear. Customer requirements shift. Advanced technologies emerge. Sometimes people and companies see change coming and adapt quickly. Other times, they are slow to adjust and lose out on business. In recent years, the pace of change has been accelerating. The competitive environment in which we operate requires increasing agility in order to stay ahead of these rapid changes. We have to continually re-align our people to our strategy, structuring our teams and skills in a way that enhances the breadth, speed, and quality of what we deliver to our customers. In that spirit, we have made some changes here at Intelsat General that will allow us to respond more quickly to changes in the market and to develop new technologies that can benefit you, our current and future customers. Mark Daniels, previously Vice President of Engineering & Operations, has moved to the newly created position of Vice President, New Technologies and Services. He will lead a group that will leverage new technologies to identify, develop, and refine new services and business models for customers. Mark, who has more than 30 years in the satellite industry, has been with Intelsat General since 2008. Rory Welch, previously the company’s Director of Space Services & Business Development, is now Vice President of Engineering and Service Delivery. In this new role, Rory will lead a team of engineers who design, implement and support the services we provide our customers. He joined Intelsat General in 2014 after 23 years in the U.S. Air Force, retiring with the rank of Colonel as the Principal Deputy Director, Mission Operations at the National Reconnaissance Office. David Agatston, previously Vice President of Finance & Accounting, is now Vice President of Business Operations, with responsibilities for administration, finance, human resources, security, contracts, procurement and legal affairs. His group handles the company’s business planning and performance measurement as well as vendor and partner arrangements. David joined Intelsat in 2007 and has been with Intelsat General since 2014. I’m particularly excited about the New Technologies and Services (NT&S) group. Mark’s team will focus on prioritizing, defining, developing, testing, productizing, and handing off new technologies and services to our sales and service delivery staff. NT&S will also handle all the proposals we create seeking new business, with the overall goal of enabling new services and capabilities for our customers. One area of focus will be creating Intelsat EpicNG-based solutions for key government applications like manned ISR and high-definition video from remotely piloted aircraft (RPAs). Another key area will be delivering IntelsatOne Flex managed services to our customers and service providers. The NT&S group also evaluates advanced satellite communication technologies such as Phasor and Kymeta antennas; electronically steerable arrays; and protected capabilities for the warfighter using commercial satellites. We expect to be evaluating and fielding a number of new capabilities and technologies for our commercial and government customers over the next few years. IGC has conducted some demonstrations with stellar results. A recent example used a Ku-band, six-by-six inch flat-panel-array antenna from Gilat on the recently launched high-performance Intelsat EpicNG satellite. The test delivered an HD television stream at a rate of 3.9 Mbps using only 15MHz of bandwidth. Both the forward and return links carried data streams three to four times greater than previously possible with traditional wide beam satellites. This antenna is currently being incorporated into a number of the small, unmanned aerial platforms under development. Other recent accomplishments include successful demonstrations of the Protected Tactical Waveform (PTW) over an EpicNG-class, high throughput satellite (HTS) and across multiple transponders on a traditional widebeam satellite. Testing on the IS-29e HTS validated the ability to use the higher order modulation and coding modes of PTW thereby delivering higher efficiencies — higher bps per Hertz — to government users. Testing on Intelsat’s Horizons 1 widebeam satellite was unique in that the PTW waveform hopped across multiple transponders. This demonstration validated that PTW terminals can provide unprecedented levels of protection by fast hopping not only within a 36 to 72 MHz wide transponder but also across the 500 MHz covered by multiple transponders. We welcome any ideas that our customers and industry colleagues may have, so please get in touch if you think there are any technology gaps or challenges that we should be addressing. Amy Saunders of Government Military Communications met with Mark Daniels, Vice President of Engineering and Operations, to talk about the new Intelsat EpicNG satellites, how they’ll be used for government and military applications, and the development of new, flexible satellites. GMC: Intelsat recently launched its first EpicNG satellite. What can you tell me about the EpicNG project? Mark Daniels: We’ve been launching Ku and C-band wide-beam satellites for years, which cover large geographical areas, like continental USA. On some of those satellites, there are steerable spot beams that can be moved to achieve different coverage as required. Those spot beams are a little more high performance than the wide beams because they concentrate the power in a smaller area. We launched the first of our Intelsat EpicNG high throughput satellites (HTS), IS-29e, in January 2016. It covers the USA, the North Atlantic Ocean flight route, the Caribbean and parts of Europe. Our HTS use even smaller spot beams than those on our wide-beam satellites. With that reduction in size, the power density roughly doubles, and there is also significantly higher gain on the receive uplink, which is important for small antennas. Our next Intelsat EpicNG satellite, IS-33e, is due for launch in August 2016. Its beams will cover Europe, Africa, the Middle East and Asia. A lot of our customers from the USA are interested in that satellite and its capabilities. Many in the industry believe that 2019 will be a critical decision-making point on the future of the U.S. Department of Defense’s (DOD) Wideband Global Satcom (WGS) constellation, with the final satellite, WGS 10, tentatively scheduled to launch some time in early FY19 (Nov. 2018 to Feb. 2019) pending launch vehicle availability, say Air Force officials. In between now and then, DOD is conducting an Analysis of Alternatives (AoA) to evaluate what future mix of government and commercial satellite systems the military will leverage in the future. While DOD understandably has reservations about entrusting the commercial sector with too much of its protected communications needs, commercial players contend that they are well positioned to provide more innovative, cost-effective options for meeting secure communication links, rather than the DOD spending billions on building out and managing the next generation of satellites. With a thunderous roar, Intelsat 33e, the second of seven planned Intelsat EpicNG high-throughput satellites (HTS), went into space successfully last week from French Guiana aboard an Ariane 5 launch vehicle. Liftoff occurred at 22:16 pm GMT on Wednesday, Aug. 24. The Intelsat 33e satellite separated from the rocket’s upper stage and signal acquisition was confirmed. (Watch the liftoff here). 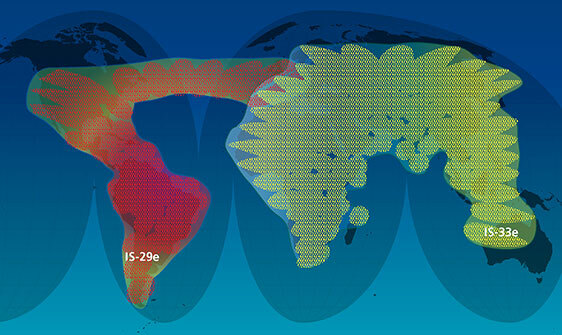 Intelsat 33e will bring HTS capacity in both C- and Ku-band to the Africa, Europe, Middle East and Asia regions from an orbital slot at 60°E. The satellite will join Intelsat 29e, the first Intelsat EpicNG satellite launched in January 2016 to serve the Americas and North Atlantic Ocean regions, to form a high-throughput overlay to Intelsat’s global fleet of enterprise-grade, wide-beam satellites. Intelsat 33e is equipped with the most advanced digital payload on a commercial spacecraft. This payload allows connectivities in any bandwidth increment from any beam to any beam. This attribute enables independent frequency selection of the uplink and downlink. Combined, these features provide unprecedented adaptability for a customer’s network configuration and topology, allowing customers to leverage installed hardware and to operate mixed-spectrum networks. Intelsat EpicNG will enable existing Predator, Gray Eagle and Reaper ISR platforms, for example, to deliver SATCOM data rates of up to 50 Mbps. But it’s not just the incredible throughput that makes Intelsat EpicNG attractive for our customers. Some upcoming HTS platforms were designed with closed architectures, limiting the users’ choice of antenna/modem combinations and teleport locations. Intelsat EpicNG is an open system, which means that users can choose their preferred ground equipment, whether that’s an installed base or a new deployment. The ability to use existing ground equipment in open systems can lead to substantial cost savings for the customer. For military customers in particular, they can leverage the Ku-band antenna/modem infrastructure already in place for existing RPAs and UAVs. This ability to use current ground equipment leads to substantial cost savings for the government, and can be leveraged in many ISR applications to support newer, smaller footprint operations that do not require on-site ground control stations. Companies are signing on for the carrier-grade HTS services and broadband for applications such as enterprise, aeronautical and maritime mobility that the Intelsat 33e payload will deliver. Companies such as EMC, Gogo, Harris CapRock, KVH, Marlink, Panasonic Avionics, Romantis, Supernet, and Television and Radio Broadcasting Network of Armenia (TRBNA), will be among the first to deploy services on the platform. Space is increasingly a contested theater of operations. Using the Intelsat EpicNG platform will be an important piece of our customers’ response to this new reality, as it looks to better leverage the technological innovation of the commercial space industry. Fred Bauer is responsible for designing and implementing leading-edge solutions for the company’s innovative technology customers. Bauer leads the migration of the company’s iDirect Evolution services to Intelsat’s new Flex service, based on iDirect Velocity. He also plays a key role in ensuring multi-network interoperability of future aircraft satellite antennas and in the engineering and support of satellite networks for very small remote antennas. Before taking on his current role, he managed multiple software development efforts to provide custom network monitoring capabilities for airborne users. He was involved in the engineering and implementation of a world-wide network supporting a mix of fixed, transportable, and mobile terminals. Bauer joined Intelsat General in 2011 after six years at Intelsat, the parent company. In his role there, he analyzed new servicing offerings and was then involved in their design and implementation. His work included link analysis, antenna performance analysis, vendor requirements specification, test procedure development, integration testing, and final product documentation. Additional work involved preliminary studies on new satellite communications technologies and support of proposal efforts. Bauer began his satellite industry career in 1982 as an engineer for Comsat World Systems, the U.S. signatory to the Intelsat consortium, pre-privatization, where he worked on the monitoring and control systems for Comsat’s earth stations. He moved to the International division of WorldCom in 1985, serving as the technical expert in satellite, microwave, and terrestrial communications systems for all of WorldCom’s international service offerings. He returned to Comsat in a management role in 1999 and rose to become Director of Systems Engineering, with responsibility for Customer Service Engineering, the Clarksburg Teleport, the Network Operations Center, the Spacecraft Control Center, and Spacecraft Engineering. He joined Intelsat in 2004 as Principal Satellite Systems Engineer. Bauer, who has a BS in electrical engineering from Rensselaer Polytechnic Institute, lives with his wife Janice in Bowie, MD. They have two children, the youngest of whom just finished college. Bauer’s main hobby is Viking-era historical re-enactment. He is a member of the Longship Company, a non-profit educational organization devoted to increasing the understanding and knowledge of the early northern European seafarers and those with whom they came into contact. The company owns and operates a 39’ longship moored on the southern Potomac River, along with a smaller færing (four-oared) boat.